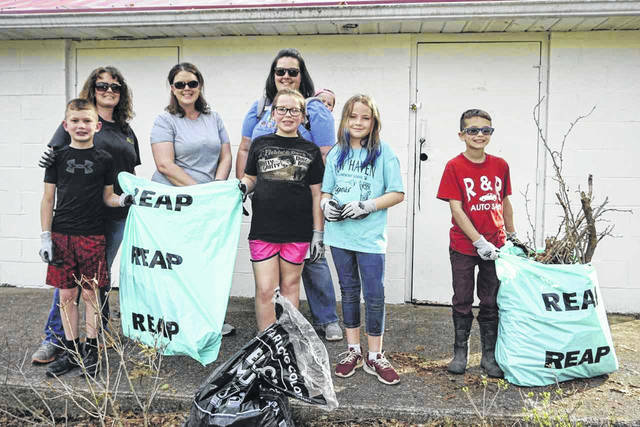 Some of the students from the fourth grade classes at New Haven Elementary School, along with their teachers and a volunteer, are pictured during a cleanup at the town park as part of the “West Virginia Make It Shine” statewide cleanup initiative. Along with cleanup efforts made by fourth graders at the New Haven Town Park, daylilies were planted, as pictured. The lilies were added to a growing list of perennials that are planted each year to enhance the park’s appearance. 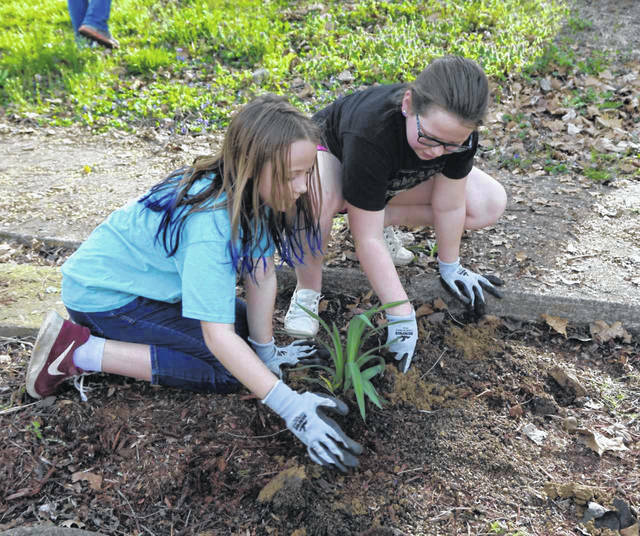 NEW HAVEN — For the past five years, fourth graders at New Haven Elementary School have spent a day in the spring cleaning the New Haven Park for the upcoming season. The project is just one element of the classroom’s year-long recycling program, which includes participation in the “West Virginia Make It Shine” statewide cleanup, as well as its original “Litter for Literacy” program. As part of the Make It Shine initiative, the students met recently after school in the park, where they cleared leaves and brush, gathered trash, and planted flowers. Teacher Shayla Blackshire, who has been involved in the program the entire five years, said the cleanup helps the town workers prior to the start of mowing season. In addition, the students plant a different perennial each year that returns to beautify the park. Shrubbery, Rhododendrons, and this year, daylilies are among the items planted. The Make It Shine initiative is held each year in April, and is a part of the Rehabilitation Environmental Action Plan (REAP). The 2018 cleanup resulted in over 240,000 pounds of litter and debris collected by more than 4,800 volunteers, according to the West Virginia Department of Environmental Protection (DEP). Last year, the class members won a DEP award for their efforts at the Youth Conservation Weekend at Northbend State Park. The award came with a $400 monetary prize, which Blackshire and fellow teacher, Natalie Greene, used to purchase recycling materials and books for the students, as well as mulch, plants and other supplies for the park. The “Litter for Literacy” program is an innovative project in which children bring in recyclables, and in exchange, receive free books. This is a school-wide project that is offered to the entire student body at New Haven Elementary.